[tweetmeme source=”pricingright”] You have a great product – be it a software offering or a physical product and your economic value-add analysis shows that your product creates considerable value for the customer. But does your customer see it that way? Since price represents your fair share of the value created, do you get a fair share if there is a gap between the true value created and the value realized by the customer? What is stopping your customers from seeing the full product value? Credibility Discount: While your calculations may be supported by analytical rigor, there are generalizations and assumptions that went into your estimate, not to mention some bias. Does your customer trust and believe your numbers? This is the credibility discount applied by your customer. Selection Cost: I wrote about the cognitive cost to customers in selecting a product. Be it evaluating all the options available in the market or evaluating the multiple versions you offer, there is a definite cost to the customer. The effect of these costs carries over from initial selection to product usage and hence decreases the product value. Cost of Doing Business: These are the costs to customers in adapting their buying process, business processes and operations, training their employees, etc so they can start doing and continue to do business with you and use your product. For example, do you only deliver on Fridays? Do you fit within their procurement system? Does your billing cycle fit customer’s accounting needs? The net is another reduction applied to the product value. Risk Aversion Discount: What is the risk your customer is taking in going with your product? Are there social concerns – how will they be perceived by their friends, peers or their bosses? For instance, if you are selling bike helmet, will it make them look more dorky? If you are selling SaaS, are they worried about availability? Reference Price Difference: What does your customer consider as the substitute or alternative to your product? What is the price they pay for that? That is their reference price. If customers had always relied on cheap offering, despite its low value-add, they will be evaluating your product base on this reference price regardless of the true economic value from your product. Reference price has been proven to decrease customer’s willingness to pay for the value-add. So despite starting with a large pie, the one you gets a share of is considerably reduced in size due to value leakage. What can a marketer do about it? 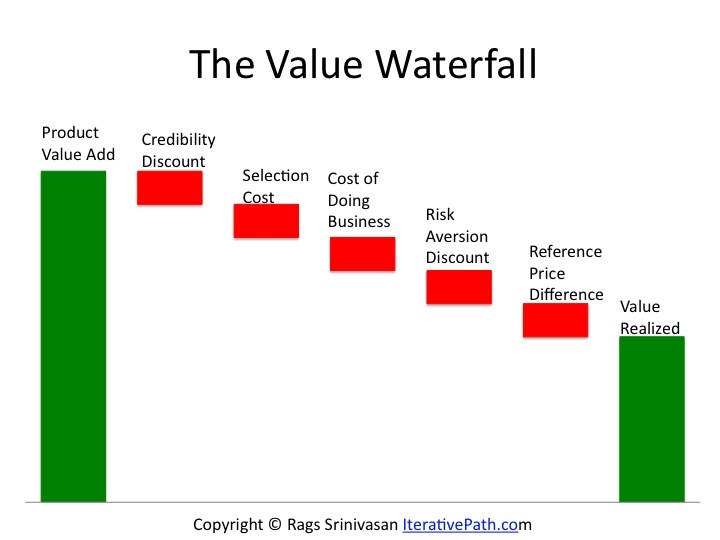 How can you not only stop the value leakage but also turn each incident into a value addition? Stay tuned for Value Staircase. Should my value pitch be reflective of this ? Should in the end the sales guys showcasing the value, discount the true value because of this bias ?